Trunk chopping has a two fold purpose. First to reduce the height of the tree and secondly to induce taper into the trunk. I have developed an improvement on the usual method in the case of the formal upright style. It should be remembered that the formal upright style requires that the tree has a perfectly straight trunk and the usual technique is not conducive to this especially if the trunk is chopped a number of times. 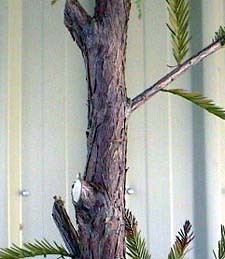 Note that with the standard method, the trunk is cut and tapered to a branch which is then wired up to become the new leader as shown here. This will always result in a bump in the trunk where the new leader starts because it is the branch that is bent. Technically this means that bonsai is not in the formal upright style. I take it a step further. The branch on the right is destined to become the new trunk of the tree. 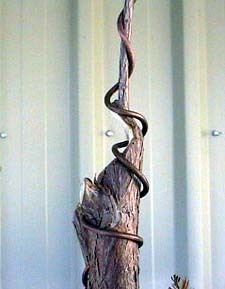 Instead of bending the branch up, I make an exaggerated deep concave cut into the trunk below the branch and bend the trunk! This serves to position the new leader directly above the centre of the trunk below it, thus maintaining the integrity of the formal upright style. When healing is complete, the trunk is perfectly straight and excellent taper is achieved.